Nike Dri-FIT is a high-performance microfiber polyester fabric that moves sweat away from the body and to the fabric surface where it evaporates. As a result Dri-FIT keeps athletes dry and comfortable. 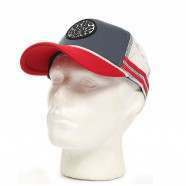 70% nylon 24% polyester 6% spandexIncorporating Nike Dri-FIT fabric in the sweatbandIcon embroideryBranded interior tapingTrucker cap mesh back with snapback closure :: Men > Hats and Caps. Dri-FIT internal sweatband for dryness and comfortFlat peak with stitching detailLogo badge to frontLogo embroidery to side and flag label to backMen's snapbackMaterial: 70% Nylon. 28% Polyester. 2% SpandexMesh panels to sides provide enhanced ventilationAdjustable snapback fastening to back for custom fit Size: one size.